It’s 5:00 a.m. on a cold, winter morning in Whistler. Most hardy souls up at this hour are just creeping out from under a warm duvet and checking the snow report as they put coffee on. But not Palo Maryncak. He steps out of a lakefront cabin and into the harsh reality of minus 15 degrees Celsius wearing nothing but Crocs and a bathrobe. He casually walks onto the dock to partake in his daily, morning ritual—a four- to five-minute-long “bath” in ice-cold Green Lake. No matter how many times he does it, the shock-factor is always there—but dealing with it the right way helps to ease the pain. To prevent what is known as cold shock response, Palo immerses himself slowly instead of jumping in. 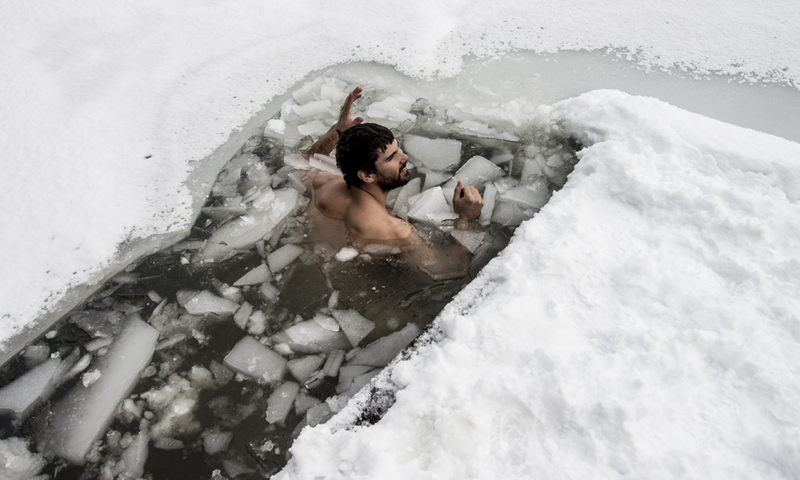 Watch the story of Wim Hof, the world’s most extreme cold water plunger here. months straight. “I almost never get sick now,” he says. Find out where to take a Polar Bear swim in the Sea-to-Sky corridor here. Not ready to jump in an ice-cold lake? Get the rejuvenating benefits of an ice-bath in a peaceful spa atmosphere at The Scandinave Spa Whistler.